I don’t understand why beekeepers are so interested in small cells. The classic picture by Dennis Murrell of a top bar with diffferent cell sizes. Those to the left are close to the entrance. An advantage with naturally built combs is that the midrib of the comb is very thin compared to a wax foundation. Therefore it’s easier for the bees to tear down combs and rebuild them as their needs changes. When a swarm starts to build combs they often start to build cells 5.3 mm big as their first need is to store the honey they are carrying in their honey stomach. Often they build quite some drone comb too. If it’s a first swarm and the queen is old they may well replace and then they need drones. Later when the nest is growing they replace some combs with new and build more honey storage away from the entrance (information from Johan Ingjald in Sweden who has studied this in his colonies). When bees choose themselves, what cellsize do they make? They make a range of cell sizes. When we look at naturally built combs in colonies where wax foundation is not used, the brown (or black) wax, that’s wax in which there have been brood, the range of sizes is smaller than in areas where you find wax in which there have been no brood. In such areas bees store honey. See the picture of the top bar comb taken by Dennis Murrell. The conclusion is that nature favors small cells in the brood area and larger in the honey storage area. After a thorough investigation the Harvard professor Jeffries Wyman published the result 1866 to be 4.7 mm – 5.3 mm for the cell sizes. The British scientist Thomas W Cowan replicated his test 1890 and got the result 4.7 – 5.4 mm. Natural selection (adaptation) is what nature uses to adapt creatures to their environment. It’s one of the forces in the Darwinian theory (the theory of evolution). Sometimes this is called survival of the fittest. This includes not only survival, but those individuals that survive, are healthy, strong and not the least reproduce most efficiently. The answer why bees want mostly (but not only actually) small cells in the brood area is obvious, isn’t it? The bee colony then is then better fit, survive better, is healthier, stronger and reproduce better. The question is not in first place about varroa resistance, it’s about fitness! The result would be lower annual losses of bee colonies, whatever the reasons for the losses may be: pathogenes, bad managemant, chemicals, etc, wouldn’t it? The varroa mites don’t kill the bee colony by themselves, but through ”cooperation” with viruses. There is a project presented in the Swedish beekeeping magazine – Bitidningen 2018, no 3 – called ”Varroaprojekt LEKA” (perfomed during autumn 2014 to fall 2017). It supports the conclusion that small cells in the brood area gives better fitness. A report of it may show up here on this blog. I don’t understand why scientists are not more interested in small cells. There are more reasons for losses than large cells in the brood area. But why not minimize one obvious cause for bad fitness that we can do something about? In Sweden the standard cell size now in practise is 5.1 mm. The use of 4.9 mm is increasing, 5.3 is diminishing. In Norway the situation is somewhat similar. This entry was posted in Cellsize, Disease resistance, Featured, Feral bees and tagged cellsize, resistance, small cells by Erik. Bookmark the permalink. 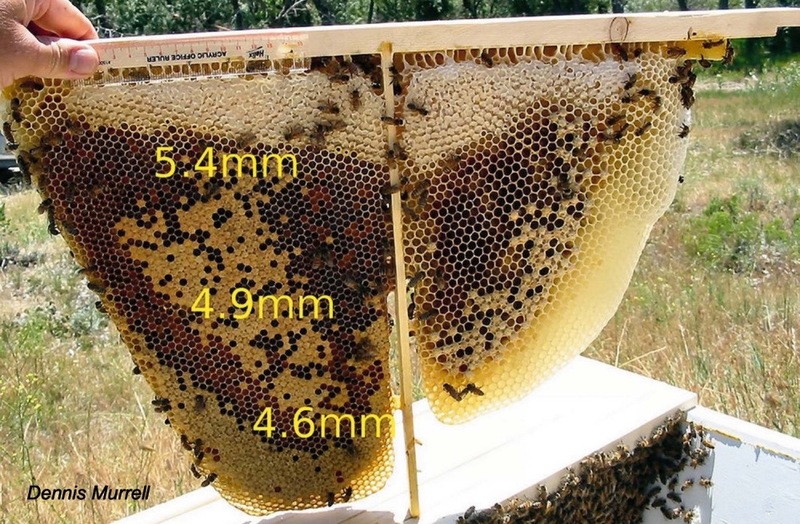 This topic is very interesting because I believe most of the beekeepers using natural comb never measured the cellsize, but still comment on this. Just as there are many beekeepers who don´t now which cellsize the foundations are that they use. There are beekeepers who claim the queen raised by big cell bees cannot use small cell comb. Next to my elgons I got some buckfast bees raised on 5.4 comb provided with fat queens, these I want to use for splits for more elgon colonies, since I only make strong splits once in year. They got the small cell comb from the elgons… no problem with laying eggs into it. With small cell and narrow frame space you can use 14 frames in a single deep square brood box which is a high advantage to have a compact broodnest and many bees in a compact area. Well, if it has no advantage it surely has no disadvantage. So the sceptics probably have only one problem: they cling to old myths that big bees bring more honey, or it is a problem to them to be open to different approaches. as you know I have very bad circumstances if it comes to my environment. I`m not isolated and I have weak mutt colonies all around, migrated and treated for years, never selected. My elgons and AMM are open mated with such stock. So why do I still have survivors, and multiple years survivors they are with the same queens? I can only say it must be the small cell comb and the results of the use of it, and some other factors like no chemicals, so probably many microorganisms; harvesting only honey surplus and some genetics still present. I made the test with a colony of AMM , one year and winter old, I decided june 2017 to keep them as “ferals” and never open them again. They are on small cell and still surviving, the queen is three years old. Low mites on the board, no defect bees. They stand single surrounded by many many treated hives. I did this after all my other AMM colonies, sisters and daughters of that queen died in winter of mite infestations. So the only selection which works in this case must have been a natural selection and the influence of the small cell comb. The observation of this colony convinced me to go on using small cell.